Signals of climate change are pervasive in marine and freshwater ecosystems, and much of my research is centered on understanding the ecological implications of environmental change. Some of the most profound physical changes on earth are occurring in Arctic marine ecosystems, where I examine responses in marine predator movement and behavior. Understanding animal movement across multiple scales is a unifying theme of my research, allowing me to engage in applied research at the intersections of marine biology, oceanography, and fisheries. Much of my work links physical factors to ecological outcomes and directly affects conservation and management. My research interests in marine and freshwater ecosystems were spurred by a childhood spent exploring southcentral Alaska and launched by a formal education from the University of Washington and a few years living and working in eastern Canada. I recently returned to Alaska, the state I have always called home, and to which I remain deeply connected. 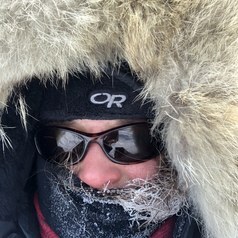 As a Research Assistant Professor at the University of Alaska Fairbanks’ International Arctic Research Center, my current and future research plans are driven by a suite of questions addressing the environmental factors and ecological interactions that influence ecological responses of sentinel marine species, and the Indigenous people who rely on them, to dynamic and rapidly changing Arctic marine ecosystems. Increasingly, some of the most rewarding aspects of my research centers on community-based, collaborative research with Iñupiaq experts and focuses on impacts to changing Arctic Alaska coastal regions. Living in Alaska offers boundless opportunities to explore Alaska’s trails, rivers, and bays with my family. Much of my past and current research involves the spatial and temporal distribution of marine mammals and associated ecological and anthropogenic factors, while in positions in academia, non-profits, government agencies (in the US and Canada), and environmental consulting. I believe that addressing ‘wicked’ problems like climate change requires the integration of diverse perspectives, such as collaboration with local experts and resource users as well as the need to interpret climate change signals across disciplinary boundaries.